Sydney, May 18, 2012 (Global Fashion Wire) - We are so happy to have AIOS working with us on Creatives uncovered "where creatives come alive". Introducing a 3 day event, Showcasing talent from all over Australia and overseas. A mash up of creative's bringing together art, music, photography, design, fashion, dance, styling and installation in a public exhibition. Come and connect, network, support and appreciate these fresh & original talented individuals, held in a industrial urban space in the heart of Sydney's city. The Australian Institute of Styling (AIOS) offers short courses and workshops to budding and future personal fashion stylists. Since 2008 the AIOS has been providing students with the knowledge and skills required to start a successful business as a personal stylist. Our express training courses have been developed from our experience in running a successful fashion styling business. Kicking off the 3 day exhibition on Thursday 24th May 2012 will be our Fashion installation Launch Party, held at the Queen Street Studio in a raw industrial warehouse space. This will be a ticket only event @ $25 pp for everybody who appreciates and supports up-and-coming gifted individuals. Also AIOS will be running a styling workshop on the last day of 3 day exhibition, Sat 26th May. Turn our success in to YOUR future! PLUS a chance to network and mingle directly with the key industry professionals behind Creatives Uncovered, Australian Institute Of Styling and Smitten With Style. - View amazing before and after makeovers! - Chat to personal stylists from Smitten With Style to find out how we help people with real bodies, real lifestyles and real budgets to feel and look effortlessly stylish. Pre-register to attend by 25th May 2012 for complimentary access to this event (limited spaces) or else $5 tickets at the door (if not sold out). 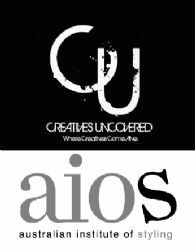 Creative's Uncovered special offer: Quote "CU" to receive $50 off any AIOS 3-day training course. Valid until 31 August 2012.